If you sign up through our Bluehost link you will also get a free blog domain name and the lowest possible price for hosting. 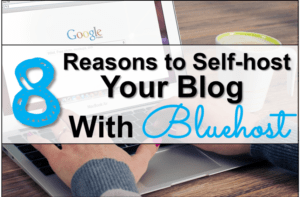 Blogging and affiliate marketing has changed our lives forever, so obviously we recommend starting a blog ASAP! 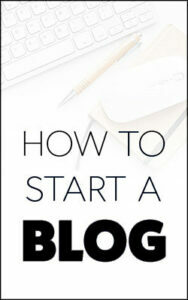 How To Start A WordPress Blog – in just 10 mins! December 2017 Income Report, $10K+ in 30 days! Be sure to check out our recommendations page for tons of exceptionally useful tools that we have used to make money online. We love them all and I we are sure you will as well! August 2017 was an OK month for our blogging income. Our affiliate marketing earnings were $2,338.81 from our stock trading websites and Amazon website. This website (Unconventional Prosperity) is brand new and we made no income from it this month. This is down significantly from June 2017 when we earned close to $7,000. The reasons for this decrease is probably just the time of year – people are on vacation etc. We have been working harder than ever on our websites, so it is a little demoralizing to see a significant decrease in income. This is how it seems to go with online businesses though! I keep telling myself that we are sowing the seeds for later in the year. The majority of our affiliate income this month was from a stock trading affiliate program. This program alone made us $2,098.9 in affiliate commissions in August 2017. You can see a screenshot below of the commissions this month. This particular product is so valuable and such an easy sell that I prefer to keep the exact stock trading program private for the time being. However, we plan to reveal our full strategy and exact affiliate programs in the future. If you are in this niche, then I suggest that you subscribe to this blog, so that you will be alerted when we publish the details of this lucrative affiliate program! It is so important to choose an affiliate program that offers high commission and converts very well. For example the affiliate programs above do exactly that, but our other source of income from another stock trading affiliate program does not perform that well. I only made $134.02 this month as an affiliate for a company called Profitly, which sells similar stock trading products. We promote Profitly very heavily, but its products conversion rate is very poor and the lower commissions per sale make this a poor choice for affiliate income in the stock trading niche. Below is a screen shot of our Profitly affiliate income for this month. We also made $26.07 as an Amazon Affiliate this month (read more about our Amazon site here) and $79.82 selling a couple of other stock trading products on Clickbank. The Clickbank products are re-billed monthly, which is something we like to have in an affiliate product. It means that you don’t need to keep acquiring new customers to make recurring revenue. We joined the Max Bounty affiliate program to monetize this blog. I had to do a short phone interview with my affiliate manager which was quite pleasant and I was approved as a Max Bounty affiliate. I am new to Click Per Action (CPA) affiliate programs so it will be interesting to see how this goes for me. 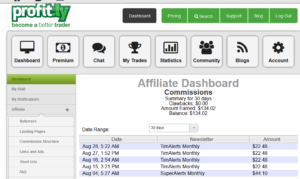 No earnings to report from this affiliate program yet! We joined ShopStyleCollective as an affiliate. It is a shopping network where you can earn per click (typically $0.05) to a huge variety of products. You can also earn commissions for any sales. We love this affiliate network because they make it very easy to save the affiliate link images to Pinterest. Pinterest recently started to allow affiliate links directly on the site, and we have been growing our Pinterest account recently to try and get more traffic. We have made about $1 so far on ShopStyleCollective and we will include more details in our next income report.